The Hazards Planning Center focuses its efforts into projects and policies that prioritize hazard mitigation, post-disaster recovery, and climate change adaptation. The Hazards Planning Center advances practices that promote resilience by reducing the impact of natural hazards on communities and regions. Every community is faced with natural and man-made hazards such as floods, wildfires, hurricanes, landslides, extreme temperatures, and more. Proper planning for hazards mitigation, post-disaster recovery, and climate change adaptation enables communities to be prepared for the 21st century. Through original and applied research, APA's Hazards Planning Center identifies practices that protect communities from natural and man-made hazards and educates planners and allied professionals about those practices. Our mission is to support the development of safe, resilient communities that can minimize their losses from disasters while efficiently utilizing their resources to recover in an improved manner. APA and Texas A&M University's Hazard Reduction and Recovery Center are developing a planner's guidebook for post-disaster recovery. 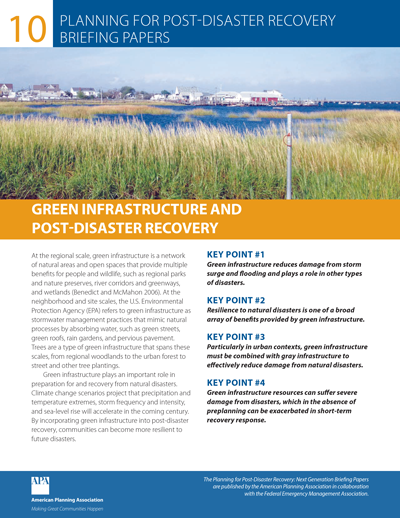 This guide will focus on the initial and intermediate recovery phases where planners can bring their expertise to bear on critical post-disaster issues. In cooperation with the Association of State Floodplain Managers, APA is conducting a series of quarterly webinars for practitioners that will include tools, best practices, and strategies on hazard mitigation planning and its connections with recovery planning and preparedness. 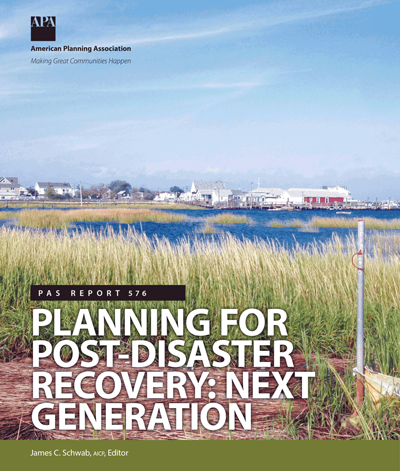 APA is committed to the continuing education of planners and their communities on the topic of disaster resiliency; thus, the compilation of up-to-date data, methodology, and policy consideration is a vital component of this goal. We encourage practitioners to review Planning for Post-Disaster Recovery: Next Generation, as well as additional supplemental resources. The project briefing papers may be used alone or alongside the PAS Report above, Planning for Post-Disaster Recovery: Next Generation. These succinct, downloadable PDFs are ideal handouts for meetings with officials and the general public. The American Planning Association is reevaluating its 2002–2010 database of state planning legislation to improve on past efforts to survey state land-use and natural hazard planning laws. APA and the National Drought Mitigation Center are working with FEMA to engage experts and stakeholder organizations to assess communities’ needs for drought mitigation assistance and planning best practices. APA is working with the Chicago Metropolitan Agency for Planning and climatologists from the University of Illinois to provide technical assistance to five pilot communities in the Chicago area on incorporating climate data into processes for developing comprehensive and capital improvements plans. End products aimed at the larger Great Lakes region will include a Guidebook, Data Analysis Guide, and case studies. APA and ASFPM will work to mainstream a variety of techniques to help practitioners incorporate climate, flood, and hazard data into local and regional capital improvement plans. They will work with regional partners in Savannah, Georgia, and Toledo, Ohio. The end products will include a PAS Report and onsite training program. In cooperation with ASFPM, APA will conduct a series of quarterly webinars for practitioners on hazard mitigation planning. APA became a partner in the National Oceanic and Atmospheric Administration's Digital Coast, part of NOAA's Coastal Services Center, in July 2010. As a Digital Coast partner, APA serves as a conduit to our members for Digital Coast online resources for coastal planners and helps vet new products. APA's Hazard Mitigation and Disaster Recovery Planning Division fosters professional communications on hazards and recovery, and helps build a knowledge base for use by planners. The October 2009 issue of Zoning Practice examines the need for communities to practice safe growth audits to prevent future growth conflicts.